I talk about self-love a lot. I write about it a lot. I instagram about it a lot. It’s kind of become who I am in my new recovery world..
I’ve been in recovery from my eating disorder for two years now. Naturally, I’m expected to love myself all the time, right? Naturally, I’m expected to not have any more eating disorder thoughts or negative self-talk, right? No. Wrong and wrong again. Maybe in our eating disorder minds that are wired for perfection, those things would be true. But in the mind of a person in recovery, like me, where perfection no longer is an option to strive for, those things cannot be true. So, let me walk you through just a portion of my day today as someone two years in recovery. This is hard for me to share and hard for me to write, especially since I just launched my nonprofit organization dedicated to helping those like us who battle eating disorders. But the truth is, no matter how much recovery we have on our side, we will forever battle and forever fight–and that’s a message that needs to be shared and told with everyone who reads this blog. It’s important to me that other fighters who might be experiencing the same thing, whether your in recovery or not, know that it’s ok to have hard days. Or hard weeks. Or hard months. Or hard hours. So, let’s start with my day today. Keep in mind that these thoughts are a product of about a week now of struggling with my own body image and self love. I kept track on my phone of all the thoughts in my head as I went through the day. I didn’t plan on writing a blog post about it. After seeing a Dove campaign that did something similar, I wanted to do it for myself so I could see the reality of how mean I am to myself in hopes that reading those thoughts out loud to myself later will help me stop. But then I realized this is something that needs to be shared to show people they are not alone. 5 am: I get up to go to the gym. “Oh my God, these pants are so much tighter than they were two weeks ago. Really, if my gym pants are getting tighter, what more proof do I need that I am just totally out of control and gaining way too much weight?”. 530 am: Arrive to gym. Look in the mirror when I am working out. 630 am: Get home and shower. Look in the mirror again before going into the shower. 7 am: Get out of shower and get dressed. 8 am: Get to work. I talk with my co-worker about how my pants are too tight and how I wish I could learn the balance from “loving myself too much which allows me to eat whatever I want and between having self control and not loving myself too much.” Seriously, I actually said that. 9 am: I am really tired already and want a coffee from Starbucks. I look up the nutritional facts on every Starbucks skinny drink on their website. I already know them by heart from years and years of looking at them over and over, but why not look again, right? Then, I calculated my calorie total so far in the day and what it would be with my Starbucks drink and without it. I did that 8 times. Over and over. When I didn’t like that number, I calculated the food I would need to eat to reach a number of calories I was ok with. I did it so many times I lost track of my totals so I had to do it 4 times. Reminder: I am at work right now. I should have been working. But instead, I was consumed with ED. 930 am: Go to Starbucks. Get the drink. A skinny tall one. I feel better it’s a tiny one. 10 am: Get back to the office and have to pee. Walk into the bathroom at work, where anyone can walk in, and lift my shirt up so I can see my tummy. Zipping up pants after I pee and remind myself of how tight they are. Again. 1030 am: We have donuts and muffins in the office. Of course I want some, but I told myself I wouldn’t. No more office food, I told myself a million times this week. But ok, someone brought it for us and I don’t want to be rude so I have a tiny piece. 12 pm: Which is now as I write this so I have updated you on my entire day so far. I’m sure you are exhausted by this point in reading. Because I am exhausted from living it all morning long and for the past week. It’s exhausting to live it, breathe it, and to write about it. It’s exhausting to fight it. And that’s what this blog post is : it’s fighting back. It’s exposing my most inner darkest most negative thoughts about myself so they are no longer in the power of my eating disorder. Once people know about it, ED loses a lot of power. Not all of it, but a lot. We are only as sick as our deepest secrets. And for the past week, this negative self talk has been my secret, and even darker of a secret has been acting as if I am ok and letting others who maybe follow this blog not know the true reality of what is really going on. Everyone fighting this battle together deserves to know we are not alone. I don’t really have a cookie cutter solution to my negative self talk other than what I am doing right now. Exposing it, acknowledging its there and facing it head on. What I will do and can do is think about what I am feeling. And fat is not a feeling, although ED wants me to think it is, it’s not. Factually in the dictionary, it’s not. What am I feeling when I really look into it: defeated and sad and mad at myself. How will I fix it: Do actions that illicit the opposite feelings. Opposite of defeated is victorious. What would make feel victorious? Finishing my news story today. I will make sure I do that. Opposite of sad is happy. What would make me feel happy? Making someone else smile. And I have done that already but I will do it again. Opposite of mad at yourself is to feel compassion towards yourself. How can I be compassionate towards myself? By leaving these negative thoughts right here on this page. They die here. On a positive note, this exhausting eating disorder mind and day is the life I lived for years before I started recovery. Every single day, every single minute. And while I am feeling a little defeated right now that I am back in that temporarily, the good news is that it’s only been for about a week, and not even all day, every day-just a few hours of each day. It hasn’t been birthdays over and over. It hasn’t been sleepless nights. It’s only been a few days. A few days that I can pick myself up and move on. And for that, I am grateful. With tomorrow being the very last day of this one year journey, I have decided that tomorrow will be the day that I smash my scale. The poll that is up on the website has almost 50 percent of votes saying to smash it, so that’s what will happen. Throughout my recovery, I have written many letters on this blog. I have written letters to Ed, and I’ve written letters to myself. And now, I will write a goodbye letter to my scale. I am sorry in advance for it being long, but I just have a lot to say to it. My letter to Ed was not a goodbye letter, as I don’t think that Ed will ever leave my life forever. However, I can and will and have learned to live above him and to live free of him. But this letter to my scale, is indeed a goodbye letter, because after tomorrow, when I smash it and then throw it away, it will forever be gone. I haven’t thought about what I would say yet, so here it goes. My precious, only trusted, heavy and white scale. Where do I begin to start to say goodbye to something that over many years, and pretty much my entire life, (except this one year journey) was such a huge part of my life? Everyday, and many times, every hour, particularly for the past three years, you specifically were my life. There were other scales over the years,but you were the one that Ed and I picked for the worst few years of our time together. I remember standing on you on my 18th birthday, on my 19th birthday, and on my 20th birthday. I remember standing on you the day I had surgery. I remember standing on you the day my grandpa passed away. I remember standing on you on my 21st birthday, and my 22nd birthday too. This year, for my 23rd birthday, you were not around. Do you remember the many times that I tried to give you up, and yet I always came back? One time I gave you up for a week. One time it was for a month. And one time, I was even sure I could do without you because I placed you at someone’ else’s house. Only to find myself speeding over to that house once everyone left for work to go stand on you once again. Do you remember when your batteries ran out, and I was late to my family dinner, because I had to go to the drug store to buy new batteries for you? Do you remember the times at 3 a.m. when I would pull you out from under my bed and stand on you when everyone around me was asleep? It was like our own little secret. Just you and me. Do you remember when I came rushing home from my vacation in Big Bear last year just to run and stand on you to see what bad news you would give me? I’ m sure you remember everywhere I put you; under the bathroom sink, under the bed, and even in the kitchen one time. I’m sure you remember the way my feet felt when they stood on you, because I sure remember the cold metal parts of you on my feet too. I remember the clicking sound you make when I had to turn you on. That sound will haunt me forever. It was the sound I woke up to every single day, and sometimes in the middle of the night, for years. And no matter how many other scales I stood on at a doctors office or someone else’s house, you, my dear scale, you were the only one I trusted. You didn’t even start out as my scale. You started out as someone else’s scale who I lived with. At first, I only took you out of her closet when everyone was asleep. And then, you moved with me into my new apartment. And then you moved with me into a new home. Somehow, along the way, Ed and I made you ours. We didn’t even care that you once belonged to someone else. But last January 21 of 2013, I gave you up for good. For the past year, you have resided somewhere with E (my therapist). I don’t know where, and I really don’t care to be honest. And I know that E does not care about you either. I gave you to her because her strength is far beyond yours and I knew your presence wouldn’t bother her like it would bother me. I wonder how you feel now that you haven’t been turned on for an entire year? Do you feel lifeless? Do you feel dead? Because that’s how I felt every time I stood on you. Maybe now you can understand my life with you for those years. And I might add, dear scale, that tomorrow, I will be smashing you. But before I smash you, I will make sure to remove your batteries. You will never be alive again. I am not sure if you will break completely, but I will be using the heaviest hammer that I can hold and I am going to read you this letter, and then I am going to smash you as hard as I possibly can. And then I am going to throw you away. Do you know what I’ve accomplished this year without you, scale? Do you know that I was the top senior reporter for my university newspaper , even without you telling me what number I weighed during it? Do you know that my brother called me his hero all because I decided to value myself on who I am, not on you or Ed? Do you know that without you, I graduated college? I graduated college on a day that I have no idea what I weighed that day.And it was at the best day ever. My Facebook status for it got over 140 likes. Your weight for me could never get that kind of popularity. Do you know that my family still loved me this year? Even though I wasn’t the number I always wished you would show me? Yup, they loved me, supported me and carried me through even without your number. You used to be my only truth; my only definition of who I was. But I’ve learned over this past year, that I am not a number. I am not a size. I am not even a definition of anything. And me is no longer a part of you, and you are no longer a part of me. And therefore, tomorrow, we will officially part ways. And I am not only smashing you for me. I am smashing you for every single person who is part of this journey. I am smashing you for the other birthdays and days and lives of others your’ve ruined; I am smashing you for every single fighter in the support group ,and I am smashing you for the many people who said this blog saved their lives. I’ve found that my soul is my new truth, and your number no longer defines me, dear scale. And because of that, I officially say goodbye to you. Today wasn’t the easiest day . It wasn’t the easiest when it came to eating, since my body was sore and Ed was loud after my incredible dinner and dessert last night that I let myself fully enjoy without him in my way. It wasn’t the easiest when my dinner plans that I had made got cancelled, which other than feeling kind of lonely also left me to eat with just Ed. An experience that while was hard, I can say I did pretty well and am proud of myself for. But I’ve learned throughout this year that not everyday or every hour or even every meal for that matter is going to go the way we plan it. And sometimes it’s ok for things to be canceled, or for feeling to be a little lonely, or for meals to be a little hard. Maybe a year ago, before I began walking this path to recovery, I would have thought that today was a terrible day. I would have thought that whoever cancelled on me is a terrible person, and I would have thought that because Ed is loud today it means I really messed up yesterday, and I would have thought that feeling lonely meant that I am alone in this world. But I sit here tonight, and I truly don’t think any of those things are true today. The person who cancelled on me had another plan come up, and while it’s not the same thing I would have done, they are just a human being, who like me, deserves some slack. Just because Ed is loud today doesn’t mean I messed up yesterday, it means I stood up to him yesterday and enjoyed myself with my family. Good for me. And just because I am feeling lonely at the moment, I know that I am so far from being lonely in life. If anything, this journey has brought me the closest that I’ve ever been to my loved ones and friends. I guess what I am trying to say, is that where at the beginning of this one year journey, I was scared to leave my world of black and white, I can now officially say that I’ve learned and embraced how to live in the gray. I haven’t mastered it by any means, but I think I’ve done a pretty good job of learning how to live in it. Of learning how to live in a world where canceled plans don’t ruin my day, where Ed being loud doesn’t mean I am a failure, and where feeling lonely is not a finite definition of my life. I don’t think perfectionism can exist in a gray world. I don’t even know if a perfectionist can live in a grey world. With that being said, I don’t know if I can say that I am 100 percent free of my old perfectionist self, but I can say, that I’ve let go of a lot of her throughout this year. The more I let my perfecionist self go, the more I learn how to master living in the gray. The grey used to mean unknown weights, unknown calories and unknown foods. But now it means understanding cancelled plans; it means knowing that feelings do not define us, and it means knowing the difference between Ed’s voice and my own voice. If I am only seeing this beautiful part of the gray world after one year of recovery, I can only imagine what other beautiful parts of this world are still waiting for me to come discover them. That’s definitely a journey that will take more than a year, and maybe it might even take a lifetime. How blessed I would be to spend the rest of my life living and uncovering this gray world, and not another day living in the perfectionist, Ed-dominated world of the black and white. Tonight I had my first celebration for my one year mark of this blog, which is officially on Tuesday. 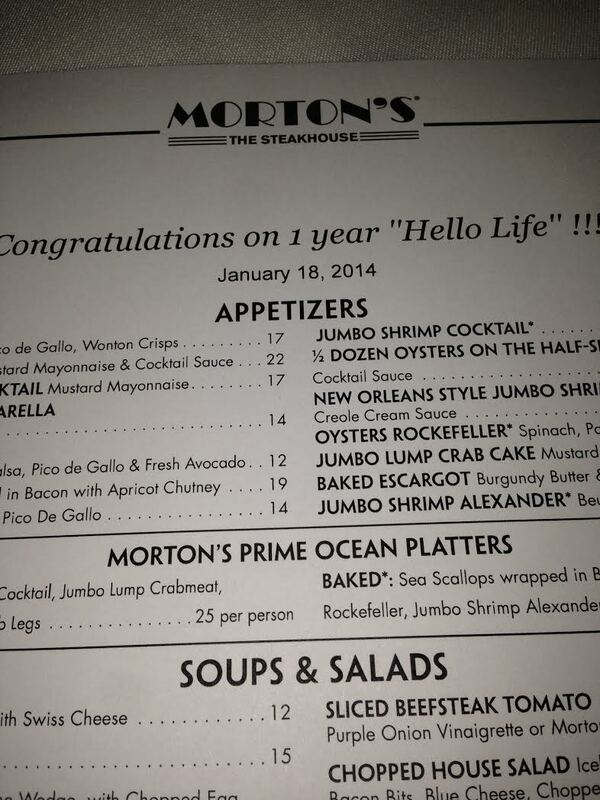 It was at the same steakhouse in San Diego that I celebrated my 6 month milestone. All I have to say about this dinner is that I love bread and butter, and wine, and steak and mostly: I love the icing and frosting and whipped cream that comes on chocolate cake. And I love the family who I was able to celebrate this first celebratory dinner with. And I love icing-just one more time for the record. I also went today to go get the hammer that I will be smashing my scale with at the end of this journey. I set up a poll for everyone to vote on what to do with my scale, and the results overwhelmingly say to smash it. So that’s what I am going to do. 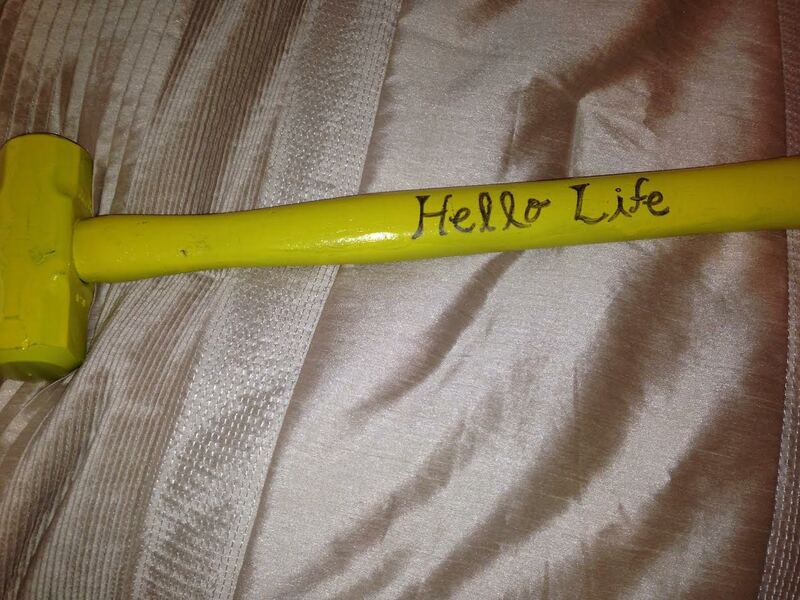 My step mom and my brothers had actually taken the time to make me a special hammer for this day about a week or so ago and even painted it yellow, hello life’s colors, and wrote “hello life” on it. It was a beautiful gesture and it is a big indicator of the kind of role they played in this journey. But as they were making it, I wasn’t able to help them. I didn’t even want to pick up the paintbrush. I wasn’t ready yet to come to terms with the fact that this one year journey is almost over. I realized that in order for me to truly prepare myself for the moment of me smashing my scale, I had to go through the preperation process myself. At first I ordered a hammer online, but it wasn’t sufficient enough. I decided that if I am going to mentally prepare myself for this moment, then I need to start with going to the store and picking out my hammer myself ; feeling it, imagining me using it to smash my scale, and sit with that idea for a while. This scale was my everything for so many years. It was my definition of who I was. 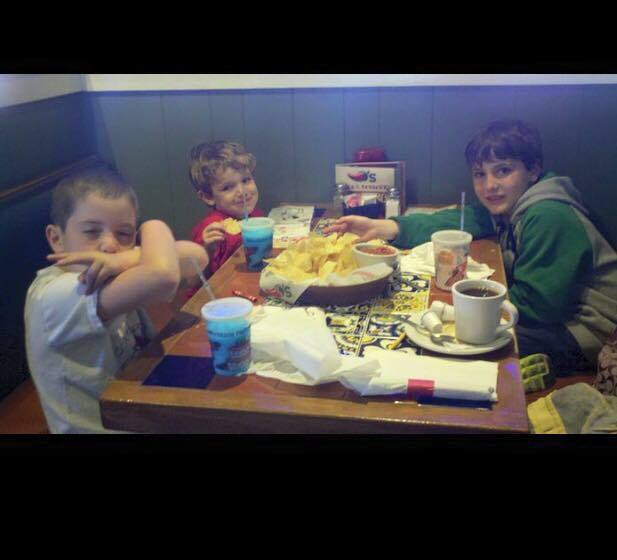 It was my good days. It was my bad days. It was my birthday. It was everyday. While smashing it will be one of the greatest acts of self love I can ever do for myself, it is also going to be smashing away a part of who I used to be. So today, I went to pick my hammer. I even got yellow spray paint to color it with Hello Life colors. I picked up every single hammer in the isle. The light ones, the big ones, and even the ones I couldn’t pick up. It took a while until I found the right one. After practicing picking it up and pretending to smash something with it, I had chosen the right one. My hammer that my family made for me is going to stay with me and in my room forever as a reminder of what it symbolizes; love and unconditional support. For whatever reason, that hammer was meant to serve that purpose for me as a reminder of that love. But this hammer, the one I got today, this will be the destroyer of my scale. So today I took one step toward accepting the ending of this journey and also one step toward celebrating the end of this one year journey. 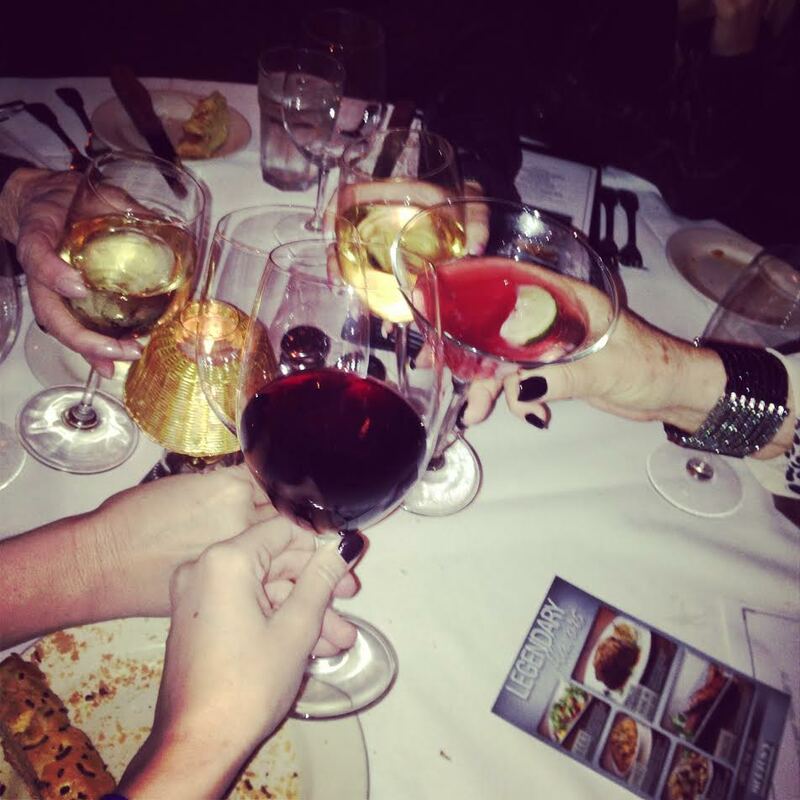 I celebrated with my mom, aunt, sister and grandma, and had the most incredible dinner ever. My sister even asked me how I feel, and I told her that I can’t believe it was real. And when I looked at her when she asked me that, I couldn’t help but remember the very first day I got my meal plan, and she came and ate lunch with me because I couldn’t do it alone. Tonight was a celebration of not just this one year of recovery and one year without a scale; but a celebration of the relationships and love that come from being in other relationships than just with Ed. And I got the hammer that will be used to smash my scale. I am still not sure I am ready to accept that Tuesday is quickly approaching as this blog has become a huge part of my life, but I am doing all the right steps to mentally prepare for it. Hello to my first celebration for this one year journey, hello to the hammer that will smash my scale and hello life. I woke up this morning scrolling through Pinterest when I saw this quote. After writing my post yesterday about me thinking that I am not where I wanted to be by this time in my journey to recovery, this quote really stuck out to me. It made me think about what kinds of actions I do on a daily basis which make me who I am. After going through those daily actions in my head, I changed my mind about what I wrote yesterday about not being where I want to be right now. I actually am exactly where I want to be at this point in my journey. And let me tell you why. I am kind to people, to strangers and to those around me. I am a sister; a caring, compassionate, selfless and loving sister. I am a daughter, a grand daughter, cousin, and niece. I am a best friend. I help others from the deepest place within my heart because I want to feel their joy with mine. I read poems to the little girl I tutor off the clock. I am open about my journey to recovery. I take care of my body and it’s needs. I proudly wear leggings on most of the days that Ed tells me to wear my now too tight jeans. I share desserts with my friends and with my loved ones. I take my brothers to the bakery to get their favorite black and white cookie on a random Monday night. I cook dinner for myself and for others. I order chocolate chip pancakes at breakfast sometimes. I might look in the mirror every morning at how my body looks, but I know my worth is based on what is within. I practice telling myself I am worthy. I am kind to myself when Ed is not. And on the days that I cannot be kind, I am understanding and accepting of what is. But most of all, every single day for the past year, if I have done one thing repeatedly, it’s that I speak my truth. My truths may not have all the answers, but they are more than enough to show me that I am indeed where I want to be right now. I do truth. Every single day, I do truth. And therefore, I am truth. I am my own truth; a truth that Ed or anyone or anything else can never take away from me. This one year journey of giving up my scale meant giving up my old truth. My old truth was only one thing: that number. My new truth doesn’t have a definition, a number, or a size and it doesn’t have answers. All it has is me. And for today, that’s exactly where I need to be.